Nothing beats standing outside in the sunshine, talking about your passion and selling your handmade goods at an outdoor market. But you don’t want to suffer at the hand of weather extremes so if you’re a vendor looking to participate in outdoor markets, you’ll need an outdoor vendor tent. They’ll shelter you from the sweltering sun on the hot days and keep you and your handmade products dry when it’s drizzling. Here are 10 things to keep in mind when picking out a vendor tent for your next outdoor market. The first thing you want to think about is how many outdoor markets, craft shows, festivals, etc. 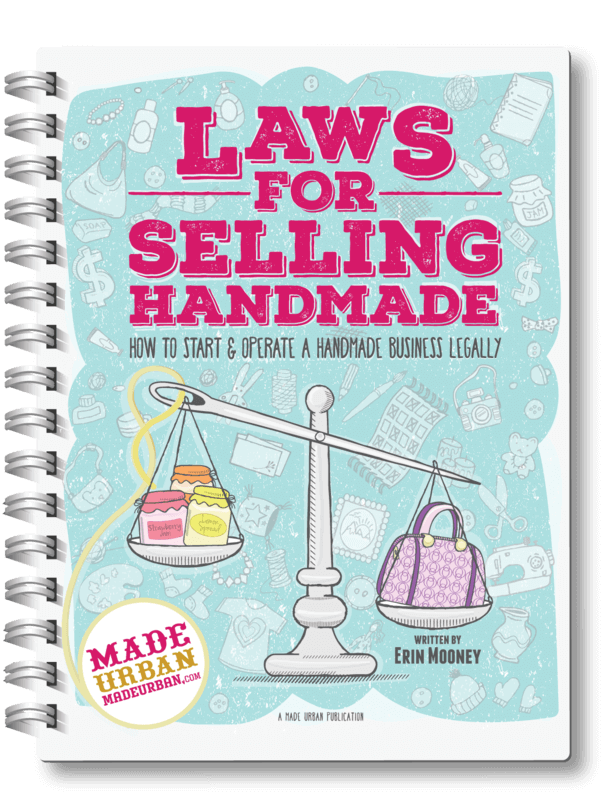 you’ll be signing up for to sell your handmade products. 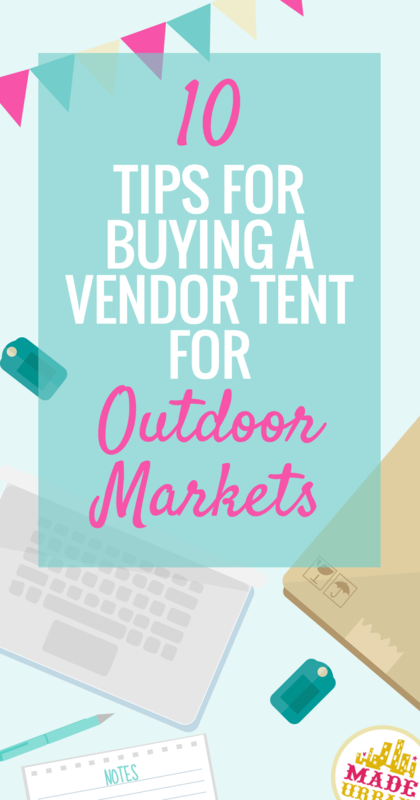 If you’re doing an entire season and more to come, it’s best to invest in a good quality vendor tent with all the bells and whistles. If you plan to sell at one or two, you can probably get away with a vendor tent that is of lesser quality and may even want to look into whether it’s more cost effective to rent one. For vendors who choose several popular weekends out of the summer to sell at outdoor markets, you can probably get away with spending between $100 and $500. Of course you can always venture outside this range and may find a killer deal on Kijiji but generally the quality won’t be there with tents under $100 and spending over $500 is likely more than you need for a basic market tent. Make sure it’s something that’s not complicated to pop up or assemble on your own or with a partner. You don’t want to be struggling to get your tent up the morning of the market when you have all your handmade products to unload and a display to create before customers start arriving. You really don’t want the fabric ripping or the poles bending after a few uses or a windy day. For a vendor tent that will last you for several market seasons to come, look for one that has a heavier, waterproof material for the roof vs. a light nylon. And go for sturdy steel poles over aluminum ones. This is going to add weight when it comes to transporting the tent to markets but will be worth it in the long run. The strength of the poles is something else to keep in mind if you’ll be using them as part of your display and hanging handmade products off them. These suckers can get heavy! Look for vendor tents that have a handy case to lug them around in and that the case has sturdy handles you can use for moving it in and out of your car. Bonus if the tent case has wheels on it, then you can roll it from the parking lot to your vendor space. Most vendor tents come with a case but if not, it may be an added accessory you can purchase for it. If you get a tent that’s too big, you’ll go over the size of spaces outdoor markets are offering. But generally, you probably don’t want to go any smaller than 10’ x 10’. As a seasoned outdoor market vendor who participates in bigger events that offer larger spaces, you can combine a couple vendor tents together or look for one larger one. It’s a good idea to figure out the markets you’re interested in and the spaces they offer to determine which size is best for you. Look for vendor tents that have straight legs, not splayed (angled out). The base of the legs should measure 10’ x 10’ but will angle up with the roof being slightly smaller than that. Not a huge issue but does mean less coverage for you and you may be missing out on a bit of display space as well. You also won’t be able to attach walls to splayed legs. Think about which color will go best with your branding; you don’t want your handmade products or signage to clash with your tent color. Colors can also fade over time as the sun beats down on them and they can also alter the true color of anything under it (a red tent may make lighter colored products appear pink). White is always a safe option and you don’t have to worry too much about it changing color over time. Vents are important when side walls are attached to the tent. They’ll allow air circulation and keep it from getting stuffy. Not to mention; if you live in a particularly windy area, the vents will help you avoid a Mary Poppins scenario of the wind picking your tent up and taking it for a ride. Vents will help ensure air can move through and your vendor tent doesn’t become a giant sail. You will absolutely need weights for your tent as many outdoor markets will inspect that each vendor has them as a safety regulation. They don’t want tents being blown around, knocking things over or injuring someone. Some tents will come with weights and there are some you can buy separately which are specifically for pop up tents; here’s a good example. But you don’t have to spend a fortune on them. Most people use sandbags or fill objects like cans, milk jugs or PVC pipe with sand or concrete and tie them to each corner of their tent. Check with the market to see if there’s a minimum weight they must be. Be sure they’re not too bulky or you’ll have people tripping over them as they wander in and out of your booth. Here’s a video on how to make weights, you could even paint them in your colors or add your logo/business name! shelter from the wind and rain – especially important if you have light products that will blow over with the lightest gust or delicate work that needs protection from the smallest drops of rain. added privacy – a back wall will hide your empty boxes and extra stock and help keep your cash box safe. separating your booth from your neighbour’s – gives a clear separation from the vendor next to you and ensures you aren’t impeding on their space and visa versa. Now that you have some points to consider and an idea of what you’re looking for, you can start shopping! Depending on your area, budget and shopping preferences, there are several companies to check out on your search. Weights – I use 5 gallon buckets with a cover ( like a paint bucket or something similar) and fill with Water AFTER I get to the show. I cover it, and tie to tent. MUCH easier ( & trust me I used to LUG weights with me to every show) and dump out the water AFTER the show, and pack away. Just be certain to insert paper or something between the sides of the buckets so they DONT stick together. Note: If they do stick, just google how to get them apart 🙂 Hot water works! One important issue not covered in this article is the fact that many municipalities now require vendor canopies at festivals and outdoor markets to have labels that indicate they meet specific fire resistance ratings. Make sure you are checking the requirements for the locations where you will be using your canopy. While it are usually the higher end (and more expensive) canopies that meet these requirements buying the correct one the first time around will save you added cost of upgrading. Take the time to confirm requirements with market organizers BEFORE you make an investment in a canopy.